National Restaurant Association Show attendees looking for the latest technology have plenty to see this year. The Tech Pavilion, Innovation Hub, and Startup Alley are great places to start, but tech inspiration can be found across McCormick Place, from exhibits to on-floor education sessions. 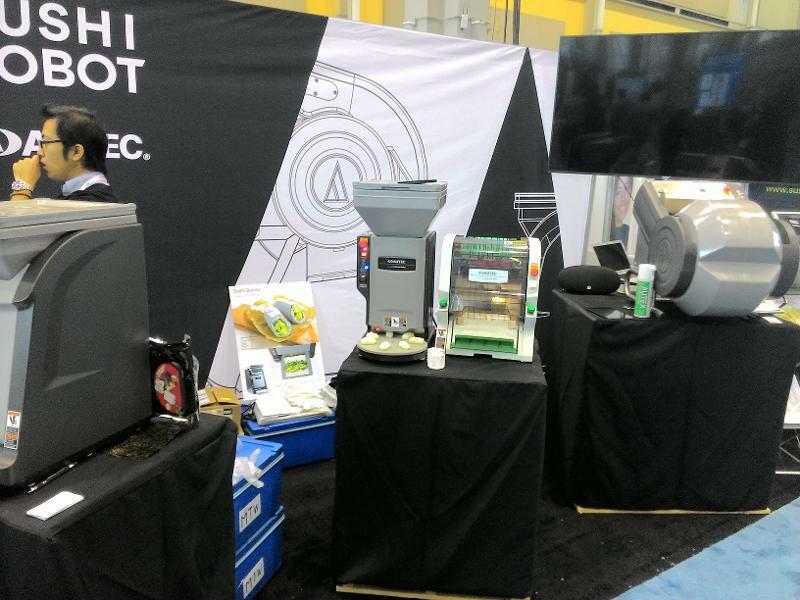 Last year on the Show floor, the buzz was about Sally the Salad Robot. She’s here again, and garnering plenty of visitors. But she’s been joined by a sushi-making machine in the BAR Pavilion, a bussing and running robot in Startup Alley, a frozen yogurt vending machine, and other equipment that’s automating food preparation. Operators are facing shortages in qualified labor, as well as a need to differentiate in a competitive market. Automating tools can serve as labor-saver or buzz-worthy attention-getter—or both. The Show finds several exhibitors touting their ability to help measure everything from employee hours worked to combo meals sold. Foodservice professionals of all stripes are using data to learn about every element of their business to help build traffic and revenue. One application discussed at a Learning Center session used social media to predict foodborne illness outbreaks. Gerrin Creek Butler, director of food protection for the City of Chicago Department of Health, described a program that went live in 2013 to help direct inspectors that are stretched thin. The system mines tweets that are geolocated within the city and use the phrase “food poisoning,” and puts them into a giant database. A person screens the posts to determine if they might be about foodborne illness, or if they are being facetious, sharing celebrity news, or other aberrations. Legitimate concerns are addressed right away—the department tweets back and asks the person to fill out a short form to explain the situation. The city can then send an inspector to the site to check it out. The system was built to learn the difference between actual incidents and non-incidents, so the human screening has become easier. The result has been an increase in the number of inspections that find temperature or holding problems—issues that are most likely to cause foodborne illness. “That’s telling me that we’re putting those inspectors in the right places,” Butler said. It may seem counterintuitive to name human interaction among technology trends. But we heard former Secretary of State Condoleezza Rice challenge operators to consider retraining employees before investing in technology that automates their work. And customer-facing technology in the stores has continued to evolve to make transactions and experiences easier and frictionless for the consumer. Enforcing the need to consider people first was Gwen Brannon, director of guest insights & analytics at The Coca-Cola Company. Speaking at a Learning Center education session, Brannon said innovation needs to focus on the context of the individual, noting that different generations engage with digital products differently. For example, while baby boomers are interested in sharing content on social media, they respond best to tools that are simple to use and ensure good service, while “centennials,” the generation after millennials, want things fast and easy, and don’t need to interact with people as much. “As long as you know where they are coming from, and you relieve their needs with technology, rather than just checking a box, you’ll more likely be successful,” Brannon said.